Is it just us or is the usual Thanksgiving side dish game becoming, well, a snooze fest? We’re all for tradition, but it’s time to put a new spin on the holiday classics—because the only thing that should be putting you to sleep is the turkey. We’re talking seasonal ingredients and old standbys, kicked up a notch. Presenting 20 nontraditional side dishes for your Thanksgiving feast. 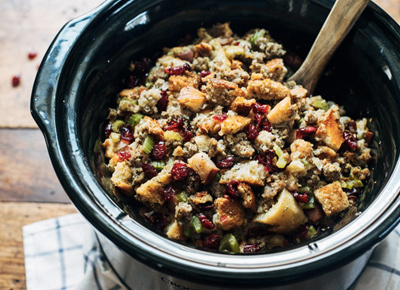 All the flavors of stuffing, minus the soggy bread. Maple syrup on Brussels sprouts? Trust us. What’s the opposite of ho-hum? This dish. That’s right: Ina’s coming over. That’s the fancy Italian way of saying “sweet and sour.” And also, yum. Prepare for all the oohs and ahhs. With sour cream for dipping, of course. There will be no leftovers. The classic side got a bite-size makeover. Psst: Store-bought puff pastry makes this recipe a breeze. This will knock Aunt Sally’s socks off (in a good way). Made with a third of a bottle of wine (just saying). They might look like a typical side, but wait until you taste the pomegranate molasses and za’atar. Thanks to Jodi Moreno, we’re officially over casseroles. You haven’t lived until you’ve tried tahini granola, courtesy of Coterie member Liz Harris. Candied bacon popcorn. Need we say more?